← Here’s to a More Fulfilling 2017! If you find yourself competing against a much larger competitor, be encouraged. They have weaknesses! 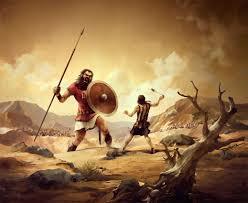 Just as Goliath did against David! Part of the challenge for the mega firms is that they don’t easily see their weaknesses. It turns out that you might be like David – thinking you have apparent weaknesses, but actually with potential strategic advantages. It’s very difficult for the larger firms to spot their weaknesses – the biggest of which are potentially complacency and poor strategic analysis. Whether you are a David or Goliath, don’t be complacent about your strategic analysis. This entry was posted in Leadership and Management, Managing Change, Strategy and tagged david and goliath, Rumelt, strategy, strengths, weaknesses. Bookmark the permalink.